Do you ever wish that strange and mysterious events would just… occur? As a lifelong fan of adventure stories, I certainly do. 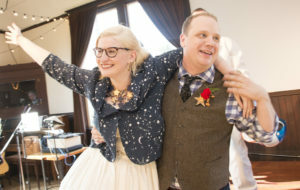 With that kind of heroic inspiration in mind, my wife Angela and I made an irrevocable decision. 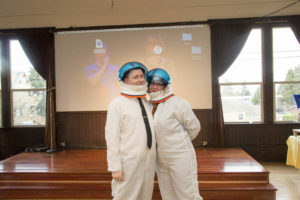 Exactly one year ago, in the warm, glowing moments directly after our space-themed wedding ceremony, we orchestrated a devious puzzle hunt for our completely surprised attendees. Because that’s how the Malena-Webbers plan their wedding. Both of us love puzzles and games, and we wanted to make sure our entire day was infused with these ideas. 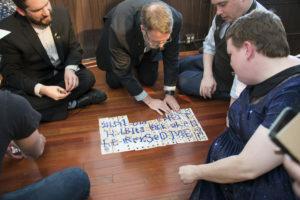 We solved a puzzle during the ceremony and had board games available during the reception. Games are important to us both and as we started playing them together, we realized that we didn’t have as much fun when a game forced us to be dishonest. Even holding onto a secret was troubling. So as we planned out the game, we wanted to make sure that we wouldn’t have to lie to anyone for any reason—or force anyone else to lie! Honesty would be our credo. Which meant I had a lot of secret preparations and work to do. I began writing the puzzles in December. They needed to be crafted for an audience of our friends, which includes both puzzle-masters and puzzle-phobes. So we wanted big, fun reveals and the ability to opt in or out as any guest saw fit. Multiple iterations later, we had our plan. 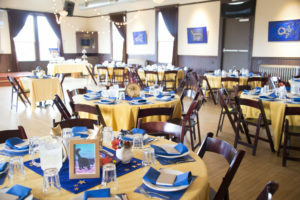 We filmed an introductory video and I frantically built props that could be set throughout the wedding without any guests knowing or finding them in advance! 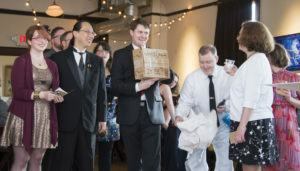 I ended up setting many of the props around the room myself and decided “I can do this myself!” was as close as I’d get to crossing that honesty line, even to the members of our wedding party. It was a struggle. But we came, we saw, we… let’s just say it went pretty well. On April 1st, 2017, we walked back down the aisle after exchanging rings and vows to (of course) thunderous applause. We found a quiet hallway and hid, knowing that the puzzle was about to begin! 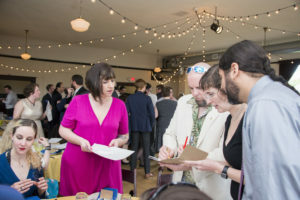 Our guests found their tables, each with a perfect theme like Lord of the Rings, Dungeons and Dragons, or Tabletop Games. You know, the stuff we like. In this puzzle step, each placemat had a large letter written on the back. When kept in order, the set at each table formed a word, with one or two extra letters, but the word was for the theme at another table! So the Oregon table might have GOLLUM+RT, which meant they needed to team up with the Lord of the Rings table! As the tables formed into three groups, those extra letters would form a series of three words, revealing the next instruction. We heard the ruckus begin as we hid, waiting for the climactic moment when they’d complete the puzzle. Time dragged on and eventually I had to peek. The crowd was stumped! I sat back, panicking and hoping for an update from a worried Astronaut. Eventually, we learned that one table had mixed up their letters and formed a word I hadn’t even considered! 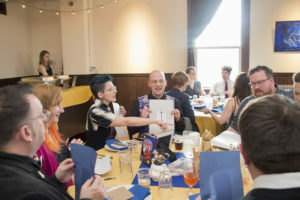 As confusion reigned, all of the placemats were removed from the tables and placed out in the floor for further public debate. They got it eventually, but I certainly learned the value of being prepared for the unexpected. This puzzle solved to RINGING PRESENT INTERIOR, and the guests quickly moved on to the next stage. 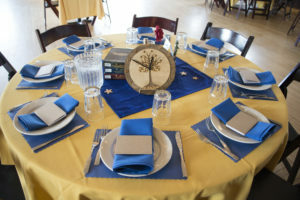 A table had been set up in advance for wedding cards and gifts, including three that I’d planted there that morning. Two made silly sounds when shaken, but one had a bell that rang loudly! 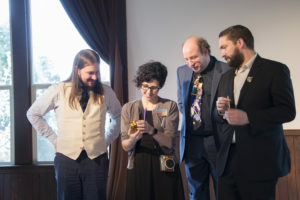 The guests looked at each other before tearing open the paper, ripping into the box, and finding a very special Rubik’s Cube covered in stickers. Has there ever been a moment in your life when you wished that your particular set of skills might make the difference between life and death? Or the difference between your friends getting their rings back or not? I wanted to give one player that miraculous moment on a big stage, while at the same time hoping that anyone in the room could solve a Rubik’s Cube! Thankfully, we’ve got the right kind of friends. When the Cube was solved, it read THE SECRET CODE BEHIND THE CONSTELLATIONS. 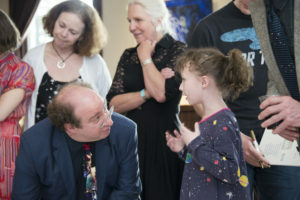 The guests looked around and saw the beautiful constellation paintings that had been painted by the incredible Susan Webber and set around the room throughout the day and quickly wondered what was on the other side. 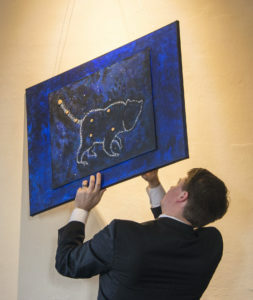 The guests peered behind the paintings and didn’t see anything. 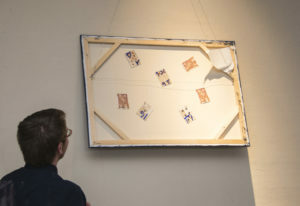 Then they noticed that there was paper attached to the back of each painting, hiding the canvas beneath. 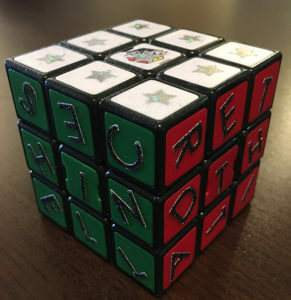 With quick sideways glances to make sure that decoration destruction was allowed in this puzzle, they eventually ripped through the paper and saw cards tacked to the inside. These cards were collected, brought up to the mainstage, and assembled on the floor for everyone to see. Though the writing made it a little tough, they eventually found the final instruction—WHAT DID THAT HOBBITS ASK WHEN HE TRICKSED ME? And like that, the rings were found. Marriage saved. In the year since we ran this puzzle, Angela and I have picked up and moved to a new city, found new jobs and new opportunities, and brought new friends into our lives. It has often been stressful and challenging, but we’ve made sure to spend time playing games, solving puzzles, and trying to maintain this constant sense of wonderment in our marriage and our lives. I think we both love the joy that comes from navigating a challenge and bringing it to successful and satisfying conclusion! 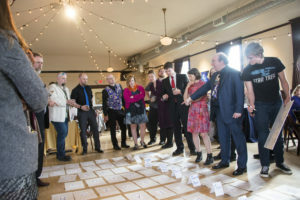 All these puzzles and games and all the friends we’ve been fortunate enough to share these events with made our lives better and helped make our wedding the most wonderful day I’ve ever had. To my dearest wife, Happy Anniversary! Here’s to many more games to come!